Mom and I would like to donate these two Bizzy for Gizzy Quilts as our way of saying Thank You to all the Cats and Beans in the Blogosphere. Without all of you, I wouldn't be here, and Mom and I would never have met such wonderful beans. Mom and I will donate the funds received to DKM's San Francisco AIDS Hop this year. As you can see, Mom has finished both 4th of July BfG Quilts. The quilts are 100% top-quality cotton with a fleece middle. They are 24" square and are machine washable and dryable. Please post your bids in the comments. The Auction ends July 3rd, at Midnight, Pacific Time. Mom will pay shipping inside the US. One other note: the price for BfG Quilts will be increasing in July. Mom has been designing the Holiday Gizzys. She arranges the pieces then photographs the design so when she sews the pieces together they are the way she wants. Then she puts all the pieces in a bag. I have been helping. You can see some more Holiday Gizzy designs at the Bizzy for Gizzy blog. I am very happy the BfG 4th of July Quilt Auction Benefit is going so well. Fiona Bun is kinda blown away. Mom says she is pretty sure she has enough Red White and Blue fabric to make another quilt, so if you don't submit a winning bid, and want a Red White and Blue quilt, email me at DarlingMillie AT Gmail DOT com. That's more than just a little freaky. 1. My Gizzy quilt is pink; Jasmine's is turquoise. What color would a Gizzy quilt be if Mom had made a Bizzy for Gizzy quilt for Gizzy? 2. Mom is taking two hole weeks vacation starting next week. 3. Why would anybody want something with a hole in it already? 4. Mom put noisy white boxes in windows in her bedroom and the sewing room. When they are making noise, she closes the door to those rooms. 5. I do not like being in a room, no matter how big, when the door is closed and I can't get out. 6. There is a birdhouse hanging on the side porch. I like watching the birds fly to it. They don't like it when I watch them. Why is that? 7. Mom found this quote: "How you behave towards cats here below determines your status in Heaven." Sounds right to me. If it's true, Malcolm ain't got no problems. 9. I have never seen it rain cats and dogs. 10. I don't think I'd like it. 11. Sometimes when Mom pets me, she touches my legs, my feet or my belly. It kinda freaks me out a little bit, and I jump away. But I always come right back for more pets and scritches. 12. Sometimes I forget to jump away. 13. Mom still says whoever orders (and pays) for the 100th Bizzy for Gizzy Quilt will get it for free. She says the Holiday Gizzys won't count. We're up around 80-something, for those of you keeping track. A year ago today, my life almost ended. 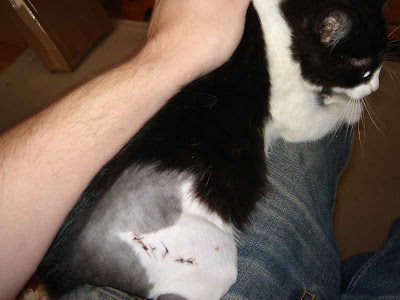 I got hitted by a car, and my leg was badly broken and my hip was dislocated. I was in the middle of a busy street with cars zooming by. I was terrified. Malcolm was on his way to get his second iced coffee and saw me, ran into the middle of the street and carried me to safety. He couldn't find my mom, and nobody knew where I belonged, so he did the only thing he could think of - he picked me up and ran to the New Haven Central Hospital for Veterinary Medicine. Malcolm already had a cat, and surely didn't need another one, but he stepped up to the plate and because of him I am alive today. I didn't even have a name! 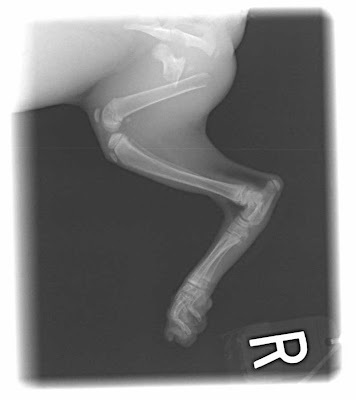 I was called "No Name Yet" or "NNY"
Here is the x-ray of my leg, after it was fixed. 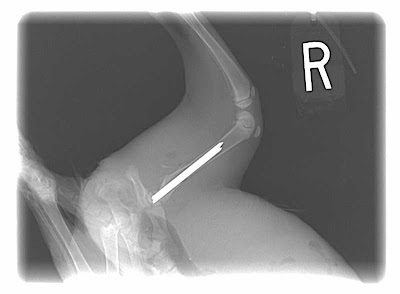 That's a titanium rod in my leg. Many of you already know this story, having found out about me way back then through Malcolm's blog. 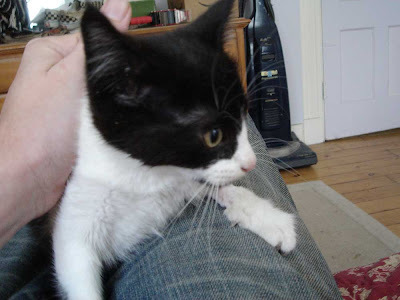 Here is the link to the Story of How Malcolm Rescued Me, and if you keep reading, you will find out how I got my name, and how beans and the cat blogosphere got together and saved me. Today is my Rescue-versary (thanks Daisy). Were it not for Malcolm, I would be at the Rainbow Bridge. In one way, that day a year ago was the worst day of my life. By a twist of Fate, it turned out to be one of the best days of my life. Start with a piece of fabric. It has to be a "long rectangle" or the size of two squares sitting next to each other. This one is 3-1/2" by 7"
Fold in half so it makes a square, right sides together. Sew the side opposite the fold, using at least a 1/4" seam. Line up the seam with the fold, like in the picture. Now sew across one of the other ends. Turn the sack inside out. A chopstick is good for getting the corners turned out correctly. Don't push too hard or you might poke a hole in the corner! Fill with 'Nip. 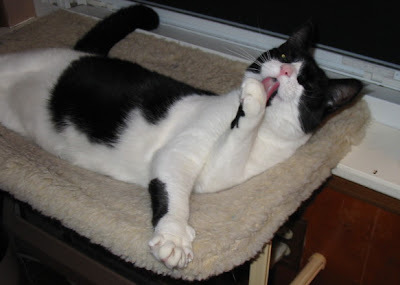 Mom uses "Cosmic Catnip." As you can see, I am supervising and testing the Nip. Somecat has to do it. When the sack is good and full of nip, bring the raw edges together so the sack is shaped like a pyramid. This seam will be perpendicular to the one on the bottom. Turn the raw edges in, and pin. Sew the pinned edge shut. Trim threads, remove pins. Ta-da! One nifty pyramid shaped 'Nip Sack. Ready for one Secret Paw, which will be on its way to a very special cat by the time you are reading this. Clean the mess made by one nipped-out cat. HEY! I resemble that remark! See, she's coming around. I bet she'll like me one of these days. I want us to be friends. I've got a real big anniversary coming up on Wednesday. It's not my birthday or my gotcha-versary or anything like that. It's not exactly something to celebrate. 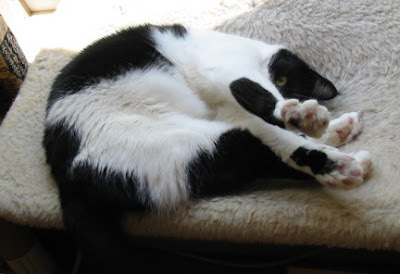 Lotsa beans and cats know what day it is and why it was such a Big Deal. And it was a Big Deal. I'll have a post about it then. Mom's cut up all the strips into blocks and has started designing the Holiday Gizzys. You can check it out over at Bizzy for Gizzy. Here's Jasmine sleeping in the sun on some clothes Mom left on the bed. I may not be a big fan of Jasmine, but she sure does know how to nap. I had to examine this 'Nip plant that Mom brought in. It's not too exciting just yet, but it looks promising. Mom and I watched the International Space Station and the Shuttle Atlantis fly overhead the other night. I thought it was mildly interesting but Mom was all in a tizzy about it. I certainly wouldn't have known about that in my formerly feral life. I got a package from Monty Q this week, but it turns out it was from Monty Q's Mom to my Mom. It's OK. Monty Q teleported over yesterday and we spent the day napping in the sun in the cat hammock after having a little bit of a nip fest. After that I tried to find Jasmine to pester her, but she was sleeping in Mom's closet. That's a No-Millie Zone. I told you all that Mr Karate got tatted last week. His Mimmay went with him, and they didn't even tell Mom. I know some of you want to see it, but I don't have a picture. It is quite nice, for a tat, very simple and elegant. It is some kind of symbol for his Karate. He said if he was gonna put anything on the outside of his body permanently, it was going to be something that was already on the inside that he believed in. Bounce Lucy and Trixie wondered if I would bat the pesto cubes all over the house. I dunno, they were pretty stinky before Mom put them in the bag. She likes gah-lic, but I sure don't. If I had managed to get them off the counter, and rip the bag open and spread the cubes on the floor, that would have been good enough for me. My Secret Paw package is almost ready. It will go out on Monday. I told Mom to get her own blog and leave mine alone. Sheesh, I'm tired of all this quilt business. So she posted about the Holiday Gizzys in progress over at the Bizzy for Gizzy blog. Check it out here. Don't expect any details about them though. That information will be posted on July 1, 2007 on both blogs. 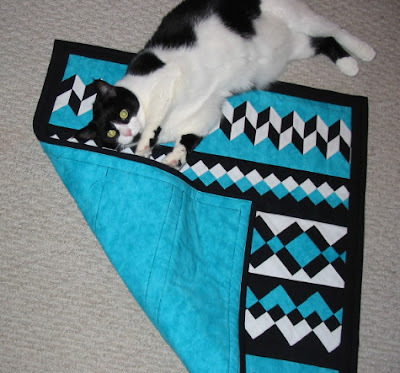 Hey, speaking of quilts, there's a nice slideshow of quilts over there, but we still haven't received pictures of many of the Cats with their quilts. Mom would like to make a slideshow of those, so if you haven't sent your picture of you with your quilt, tell your bean to get going. And I bet you don't need 13 guesses to know what - I - would do with the stuff. Looky! I got 'Nip! Doesn't it look nice? Three pots of my very own Nip! Mom says it's doing very well and it has grown a lot in the last week, and it's getting bigger. She says she will have to move the plants in the smaller pots to a bigger one this weekend. Of course her Basil is BIGGER! She bought it already planted though, and kept it in the side hallway until it stopped frosting. Then she put it in a big pot outside, so naturally it is lots bigger. She has lots and lots of little basil plants in lots of other pots. You can see something she calls Jenn-o-vay-zee Basil in the reddish pot on the right. So anyways, after she watered all her pots tonight (and she has a lot of them), and after she took these pictures she says "Hmm, that looks like enough Basil for a batch of Pesto." Does this not look like THE most disgusting stuff in the whole planet? She called it Green Gold (ah, no, gold isn't green, it's Gold!) and then she put all over her dinner. I thought I was gonna hurl. After that she put the yikkey green stuff (Now she calls it Pest-oh) in ice cube trays, covered it with sticky plastic wrap and stuck it in the freezing winter box. Good. I hope it dies in that thing. What can I say? I have a very strange Mom. Mom likes Tyler Florence's recipe for Pesto, which you can find here. She says it stays bright green because of the parsley. And check out the Bizzy for Gizzy blog. Mu Shue Pooh has posted pictures of himself and his Gizzy quilt. some more Holiday fabric for the Holiday Gizzys. Mom finished 3 PTU quilts and sent them off. She washed about half the windows and dusted the window sticks and cleaned the windowsills. She dragged the rug sucker all over the sewing room. She started cutting the strips for the Holiday Gizzys. She made a big batch of what she calls Black Bean Soup for Mr Karate because he has a cold and she wants to make sure he has good stuff to eat so he can get better. I think the stuff looks like -- well -- never mind. You don't want to know. She did part of the washing machine shuffle. She didn't finish. I know this because I napped in the big pile of laundry all day Sunday. Tiger got beat by an Angel (don't ask me). They ate real live dead chicken last night and I didn't get any. They say they went to see 13 Oceans, but I think somebody's prevaricating. There aren't that many oceans in the whole wide world. Oh and I got a package from Monty Q, but Mom just found it and she won't let me open it until after she comes back from her day hunting. Here I am enjoying my new quilt. I think it sets off my furs quite nicely. I'm glad Mom put it on the bed because I am the cat that sleeps here. From here I can see watch what happens in the half the house. It was a nice weekend. Mom finished my quilt on Friday night. Actually on Saturday morning. She worked in the sewing room most of the day on Saturday. It was warm, so I napped in my very favorite spot in her closet. I have no idea how the little pest spent her day, nor do I care. I do know she wasn't particularly happy this morning when Mom was outside mowing the lawn and using the weed whacker. Mom isn't putting her food dish on the counter anymore, it's on the floor not far from my own dish. The little pest doesn't like it. She eats out of my food dish, and thinks I don't notice. So what -- I just eat out of hers! Mom's big secret is this: She's gonna make Christymas Gizzy Quilts to sell. I told her that it wasn't a secret. On a Thursday Thirteen post in May (here), we told everybody that Christymas kitty quilts were gonna go on sale in the fall. So she couldn't keep shh-ing me every time I wanted to talk about the Christymas quilts. The quilts will be a "Limited Edition." That means Mom isn't going to make a lot of them. She's going to make like 12 or 16 or 20 (she doesn't know yet), but she won't make more. They will go on sale in "the Fall" (she doesn't know exactly when either, but not until September), and she won't take orders for them until then. Mom says we will post the full details about the Holiday Gizzy Quilts on July 1, 2007. 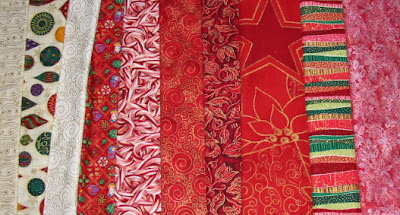 Here is some of the Christymas fabric she has already bought for the Holiday Gizzys. Oh Millie, but you look so Cute! For those of you who are new to my blog, check out the Bizzy for Gizzy blog. We have a nice slideshow of 50 Gizzy quilts for you to watch. This is about as close as Jasmine and I get without fighting. I want to play, she doesn't. 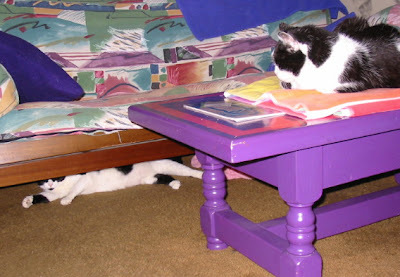 Now that our quilts are finished, Mom can work on the two she is planning to auction to benefit cats in the blogosphere. They will be special quilts, and Mom wants to have pictures by Sunday. We need to know which cats to help. Leave your suggestions in the comments. 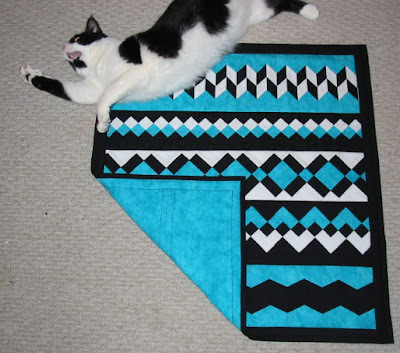 Check out the neat slide show of quilts Mom made over at the Bizzy for Gizzy blog! I got to try it out Jasmine's quilt. Ha! Ha!